April 2 I went to see the opening of Kirsten Reese Angelic Streamers in Paulus Church in Oslo. Home made cassettes with music meaningful to the contributors from any genre were mixed and send out in small sequences through small loudspeakers in the church. Rolf-Erik Nystrøm (sax). A very inspiring evening and my first meeting with the Chinese harpinstrument gu Zheng. The harpist used a very virtuous technique using a bottleneck on many fingers, and the instrument was resonant and beautiful. As always it was great to hear Rolf Erik and his improvisations. 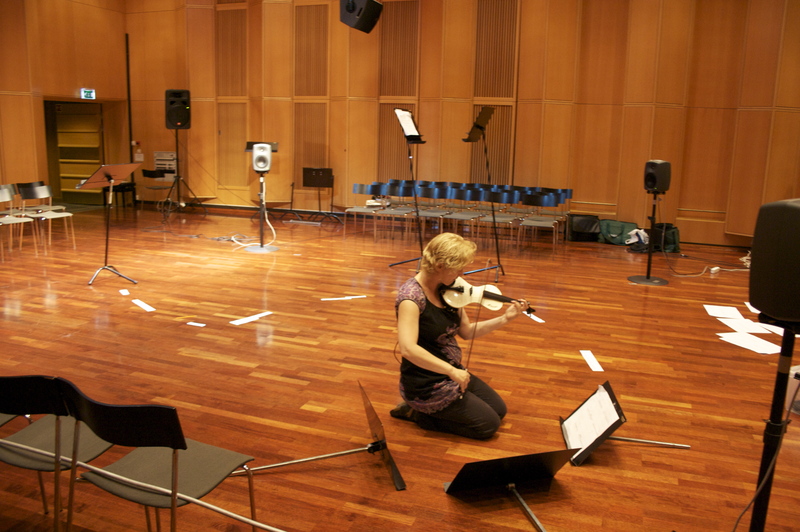 March 9-13 I participated on a FTM workshop at Bek in Bergen led by Diemo Schwarz from Ircam. A very challenging but interesting workshop. FTM is an extension for Max/MSP and PureData providing a small and simple real-time object system and a set of optimized services. (http://ftm.ircam.fr/index.php/Main_Page) Towards the end of the workshop he also went through Gabor and CaraRT. In Gabor I founded some really interested pre-programmed patches I want to try out. Friday 13.3 I played a concert at Landmark together with Diemo Schwarz. 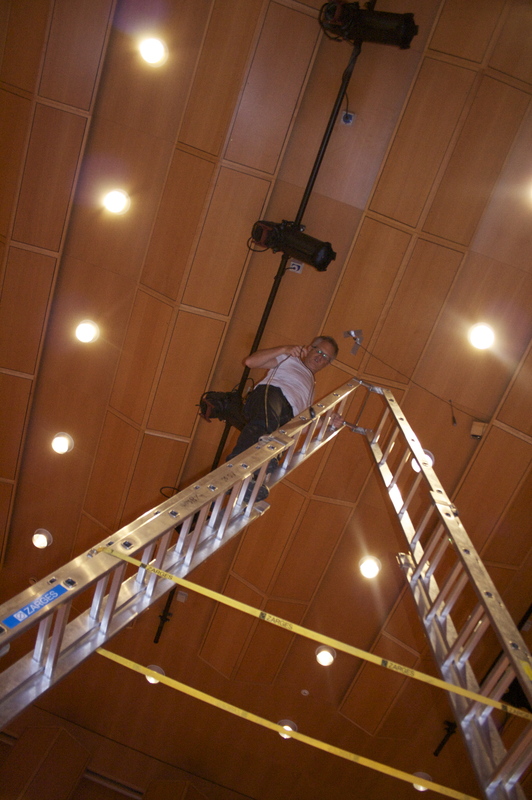 He first had a soloimprovisastion followed by our improvisation and then the soundartist James Webb performed. 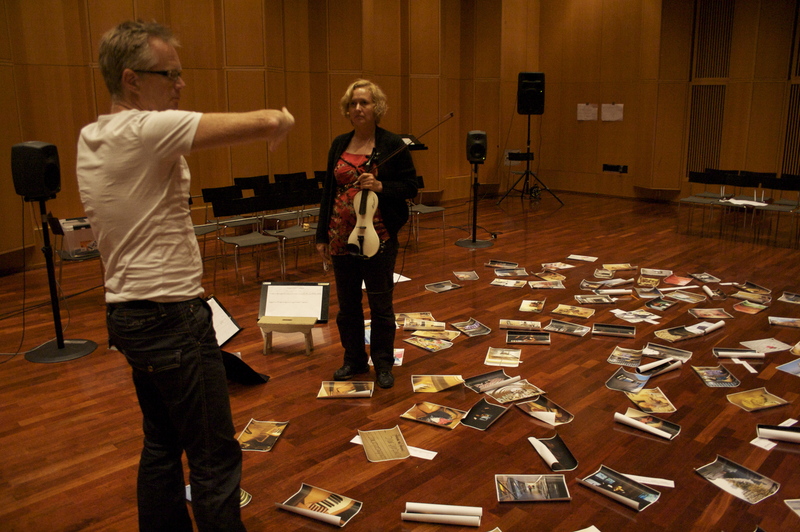 During the stay I also worked with Thomas Dahl creating some new soundscapes for our piece. He used some of his favourite filters and features in Ableton. I think we have some really interesting material now; I just have find time to work and develop sounds and practice with the midipedal. I want the pedal for to feel like an extension of my instrument so every move become smooth and sensitive. I also worked with videoartist Mattias with our realtimeimprovisation concept. He is now using a “box” to project on. It feels much more like a symbiotic connection between audio and visual when we both relate to the visual material on the box. On March I rehearsed with Diemo Schwarz at Bek. It was really interesting. I hope I can put some sound out in a while. Mattias Arvastsson projecting on an object. We will use this for our next gig. February 26 we premièred Victoria Counting II together with pieces by Frounberg and Kruglevicius. The whole performance called counting, memory and interrogation was full in the first performance. I think it worked well with the performance as a whole and that the diversity of the pieces gave variation for the audience. I have got lots of positive feedback, but also new thoughts about future work for the piece. I really like to be in a “closed” room surrounded by audience, 8 speakers and the videoscreens. We separated my sound so the 4 genelec,s in the inner circle had the non processed violin sound, and the four big speakers in the corners of the room had the processed sound. A good idea from Ivar Frounberg. The fact that Henrik Hellstenius and I have worked with the human, musical, staging and visual questions for many years, has changed my way of looking at musical pieces. I see them as a long lasting projects with potential of great development rather than a piece. I used a whole day reading texts by Gurdjieff trying to understand the end of the piece. What does happen after you have been counting from 1-50 and back 7 times observing yourself and your thoughts? Is it possible to be more present in the daily life with all your roles and doings? How do you cope as an artist with all your stress and obligations? The piece creates an arena for me to invstigate this issues in an artistic way and hopefully will tha audience also feel some familiarity in these issues.